First Encountered: 16.1 "Bah! Humbug!" 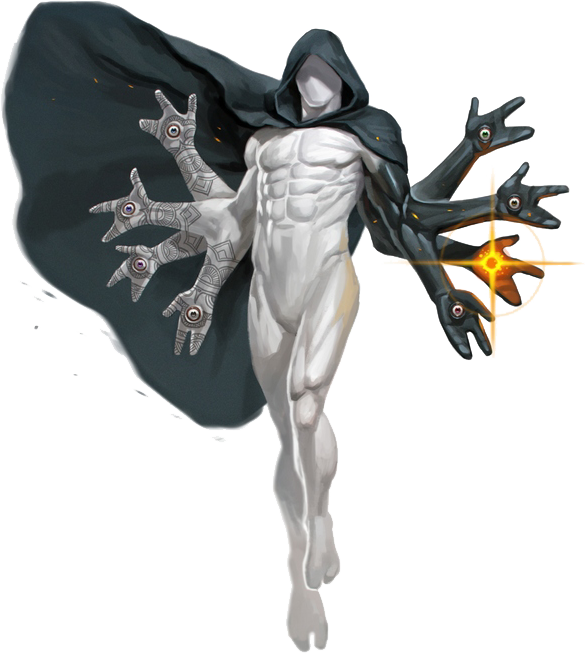 Description: "Shrouded in a dark cloak, this featureless humanoid has 4 forearms that each split off at the elbow, and an eye on each of its eight palms." Lipikas stand about 13 feet tall but rarely weigh more than 200 pounds — their bodies seem to be hollow. Little distinguishes one lipika from another except the patterns upon their forearms and the colors of their palm-eyes. Information: Their duality springs not from opposition but from understanding that all actions and reactions are the crests and troughs of the same cosmic wave. While it may seem to a casual observer that the Lords of Karma simply wander the universe looking for random events of importance, from the momentous to the mundane, what they are actually observing is the rhythm of causality, the way that one action becomes another and affects everything in the grand scheme of reality. These powerful creatures not only observe and report; they also meddle. Lipikas consider themselves the judges of willful karma. This often leads to friction with those who would steal, use, or destroy souls — such as demons and night hags. The reason for the aeons’ interest is diff icult to ascertain. There seems to be no overriding philosophy concerning the nature or purpose of the souls lipikas manipulate. Lipikas use their specialized abilities to interact with specific entities across the planes. Sometimes they act as guides to such creatures, while at other times they set these subjects upon a new course entirely undirected. Lipikas give their subjects guidance on how to adjust their actions within their current forms to achieve some karmic imperative or progression of personal enlightenment. Often such advice seems to contradict any sense of intuition, reason, or cultural concepts of morality. A lipika is just as likely to chastise a righteous person for her charity and goodness as it is to scold an evil creature for its misdeeds. To the lipika, the balance of alignments and morality is inconsequential beside the realities of action and the bonds of cause and effect. A lipika that is focused on a specific task — whether observing a significant historical event or delivering a message to another being — typically ignores other creatures unless they attempt to delay it from performing its assigned task, at which point it may become violent in its reactions. While it seems they would rather manipulate events subtly, lipikas are capable of great force when faced with those who would thwart their plans. However, the goals of lipikas are typically so abstract that their intervention often seems random, and few mortals have figured out how to placate them. It is suspected that they are, in some way, agents or shepherds of the Draconic Prophecy, or that they may even be one of its direct manifestations.